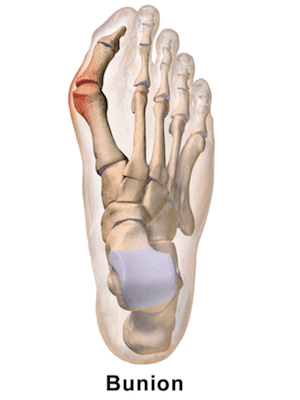 Bunions are most often caused by an inherited faulty mechanical structure of the foot. It is not the bunion itself that is inherited, but certain foot types that make a person prone to developing a bunion. Although wearing shoes that crowd the toes won’t actually cause bunions in the first place, it sometimes makes the deformity get progressively worse. That means you may experience symptoms sooner. Bunions are readily apparent—you can see the prominence at the base of the big toe or side of the foot. However, to fully evaluate your condition, the podiatric foot and ankle surgeon may take x-rays to determine the degree of the deformity and assess the changes that have occurred. Because bunions are progressive, they don’t go away, and will usually get worse over time. But not all cases are alike—some bunions progress more rapidly than others. Once your podiatric surgeon has evaluated your particular case, a treatment plan can be developed that is suited to your needs. Sometimes observation of the bunion is all that’s needed. A periodic office evaluation and x-ray examination can determine if your bunion deformity is advancing, thereby reducing your chance of irreversible damage to the joint. In many other cases, however, some type of treatment is needed. Early treatments are aimed at easing the pain of bunions, but they won’t reverse the deformity itself. from your podiatric surgeon or purchase them at a drug store. • Activity modifications. Avoid activity that causes bunion pain, including standing for long periods of time. in treating the inflamed bursa (fluid-filled sac located in a joint) sometimes seen with bunions. length of the recovery period will vary, depending on the procedure or procedures performed.